Today we are going to share with you a great exercise that was created for the 2015 Transition Network Conference at Seale Hayne in Devon. On the second day we did a big Open Space event, which was introduced by Maggie Seeley from Transition Alberquerque in New Mexico. Rather than the standard way of explaining Open Space, which you may well have done, Maggie and a group of Transition Trainers developed a different way of explaining it, based on how a flight crew gives passengers safety instructions and information about the flight. Maggie has kindly allowed us to post the script they used to do it. What else do you need to take your next steps in Transition? (Post on newsprint). “Welcome to Open Space is presented by Transition Travel – the slow travel people. Good morning, This is your Captain speaking. I am Maggie Seeley from Transition Albuquerque, New Mexico. Welcome aboard flight TN2015, biofueled (gluten and corn free), with stops in Transition towns and communities all over the world. We are about to embark on journey through Open Space. If you are wearing your seat belt – our advice is unbuckle it! Seat belts are unnecessary for this trip. Let me introduce the Flight Attendants. 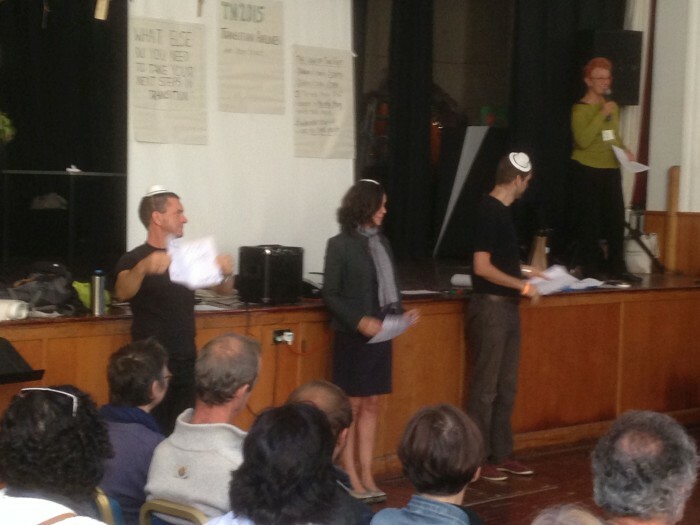 Hal and Inez from Transition Totnes, Yoav is from Transition Israel and our Senior Steward Naresh is from the Transition Network (see photo below). Please listen carefully to the following safety instructions, and pay attention to your Flight Attendants who will be demonstrating the latest in safety equipment. 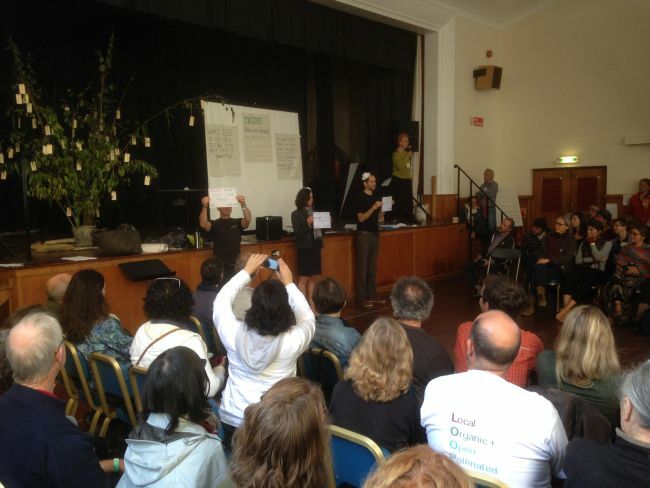 We use Open Space because it is a democratic process. It gives equal opportunity to young and old, men and women, professionals and lay people, hub or initiative folks, everyone is participating. This is your and our open space. Open space works by you taking responsibility for it. I am the Captain but you are responsible for the Open Space outcome, for what happens. In our flight regulations, there is only one law – The law of two wings, sorry, The Law of Two Feet. If you feel you are not contributing or not learning you are free to leave /take off from that session and go to another table, another discussion, somewhere else. When it finishes it finishes. whoever comes is/checks in for the flight are the right people. Who has been on an Open Space flight? Please raise your hands. If you haven’t been on an Open Space flight, and the cabin pressure drops or you feel confused, consult one of these people who raised their hands. Otherwise, just go with the flow. WHAT ELSE DO YOU NEED TO TAKE YOUR NEXT STEPS IN TRANSITION- the Flight Attendants point to the newsprint. Because our flight time as been shortened, we will take the most direct route to our destination. You may choose one of three roles in our Open Space flight TN 2015. BIRDS – Birds don’t have to be an expert in that topic to hold a session, they just have to have a passion to have that issue discussed, to stay in the nest and to ensure the the discussion happens and that everyone gets a chance to speak. Birds are to stay in a particular nest (one of these tables) and not fly away. BEES & BUTTERFLIES – Everyone else can become a Bee or a Butterfly. The bees and butterflies will come to their nests. Those of you who wish to be a Bee can buzz about various nests and conversations and cross pollinate ideas. If you choose to be a Butterfly, you can fly from nest to nest, just listening or go outside and have a conversation over tea. Sometimes the most important conversations happen in this way. Once the Birds have decided their issue, they write it clearly in 5-7 words, capital letters. The Birds fly over to a Flight Attendant with their issue written on a paper, and be directed to the Emergency Exit. We will sort issues on the spot so that they can be posted in the Space & Time matrix. The sorted topics (many Birds will contribute ideas) will appear on the Time & Space matrix along with the nests (tables are numbered). Birds also keep a short summary of the conversation in their nest (on the flip chart paper at each nest/table) and post it on the walls at the end of Session 1 and Session 2. ( Session 1 is from 10:30 to 11:30am and a Session 2 is from 12 to 1pm), separated by a 30 minute layover. We will be landing at 1:00pm. Your Flight Attendants will not serve your lunch. It will be available at the Refractory. At the end of each session Birds from that nest need to take responsibility to bring the flip charts to the front of this Grand Hall and where we will pin them on the wall (Flight Attendants move to the wall space and point.) Anyone who was not at the session can see what was discussed. Participants are encouraged to take notes and develop their own action plan for their flight, trip home. Consult the Time and Space matrix for your issue and your nest/table number. Go forth and have fun. Each one of you takes the responsibility for leaving this flight with a clear sense of direction about what Transitions are ahead, what steps to take when they land at home, in their communities, in their families, in their workplace, in the world. Once again, welcome aboard TN 2015, an Open Space flight destined to a fabulous new reality of a transition to a sustainable world, created together by the passengers, birds, bees, butterflies and the flight crew. We’re on our way together. It’s a fabulous journey.